Hair Transplant is quite popular all across the world as the most effective hair restoration method with natural appearance. But, there are various challenges faced by surgeons performing hair transplant. One of such challenges is Psoriasis. It is a chronic and long-term skin condition that is most likely associated with a genetic predisposition. Although it is possible to perform hair transplant, there are still some risks that potential patients are required to be aware of, before undergoing a hair transplant surgery. For example: New lesions can develop after the hair transplant, which have to be treated before they lead to larger issues. Psoriasis is a skin disease with red scaly patches. Usually it is found on the elbows, knees and scalp area, but it can appear on other common body parts which attribute to friction and rubbing. In scalp, Psoriasis appears as dry flakes or severe dandruff on reddish skin. Hair loss can happen due to scalp Psoriasis. The scalp psoriasis generates the intense itchiness in the scalp area and may also cause stress leading to hair fall. Also, if a person itches the psoriasis area in the scalp, it can cause infection and hair loss. 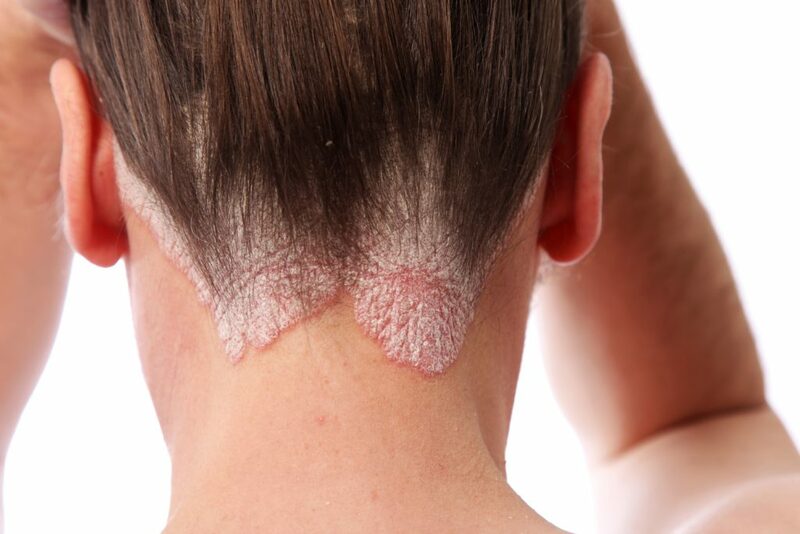 Psoriasis can cause a phenomenon called koebnerization. This is when new psoriatic lesions can develop on the skin due to trauma. Typically, the areas of the body which are at most risk include the elbows and knees, which are more at risk for low impact injury. Surgical wounds, like those created during FUT (Strip surgery) have higher chances of koebenerization as compared to Follicular Unit Extraction (FUE) but overall the chances are minimal with inactive disease. Those having recent disease activity should receive treatment to control psoriasis first, before going for a transplant. For a hair transplant, the scalp must be kept as clean as possible. Special shampoo and lotions might be recommended in some cases. At DERMACLINIX, we have done hair transplant in many cases of psoriasis without any difficulty but the treatment needs to be individualized. For consultation with Dr. Kavish Chouhan, you can contact us at +918588827963 or +918882227080. Dermatology, Hair, Hair Fall, Hair Loss, Hair Transplant, Skin. permalink. A Few Things You Should Know About Ichthyosis!